Inspired by Neal Caren’s excellent series on Big Data collection and analysis with Python, I want to work on a set of tutorials for some basic collection and analysis as well. I’m drawing on some of my previous “tworkshops” that are meant to bring people from zero knowledge, to knowing how to move around basic analysis of Twitter data with potential for parallel processing in systems like Hadoop MapReduce. Let’s start with the basics of what the data look like and how to access it. This got posted at R-bloggers last night, after the men’s 100 meter Olympic event was over. 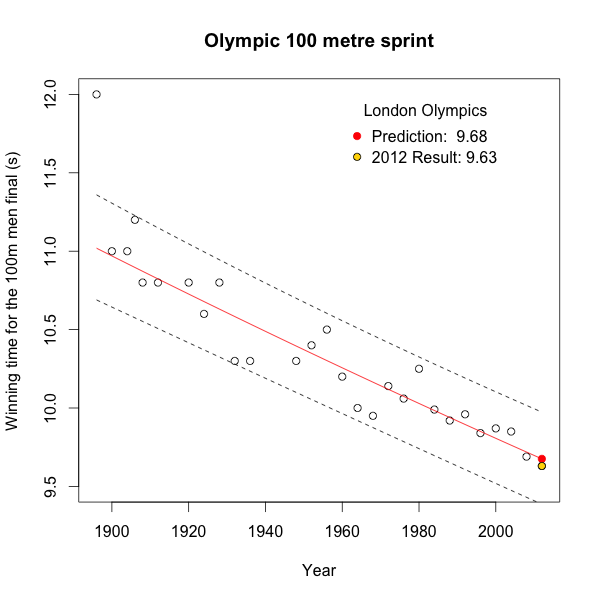 Marcus Gesmann predicted Usain Bolt’s 9.63 second result within 0.05 seconds. Even better, he did it using a simple log-linear model that didn’t control for any other factors. Check the original article at R-bloggers, which talks more about the progression of faster running times and includes the R code used. 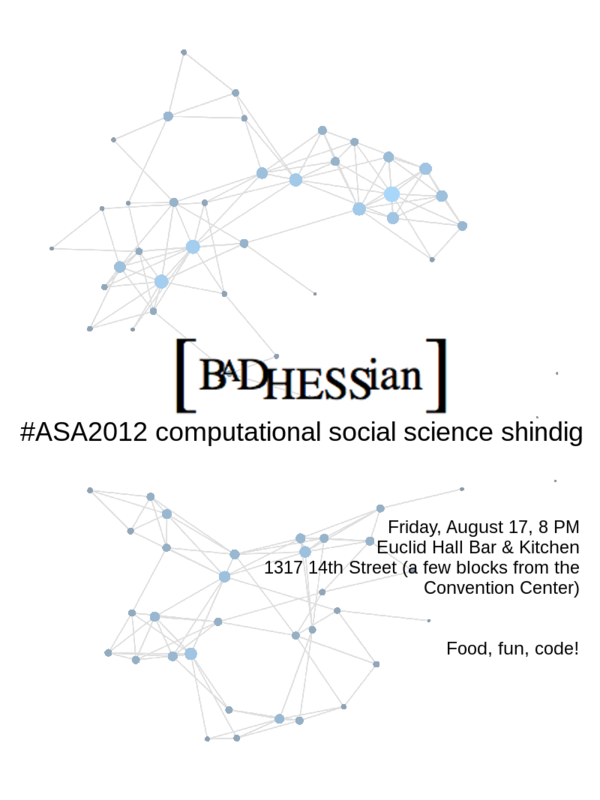 Posted in Logistic Regression, R.
Announcing “Ask the Bad Hessians”! We’re really excited to launch a new portion of the site today, what we are calling Ask the Bad Hessians. The name is a bit of a misnomer — it’s actually a crowdsourced site in which anyone can ask — and answer — the questions posted there. If you are familiar with Stack Overflow, the software we’re using is a clone of that. When you post a question, anybody can reply with an answer to it. Answers are voted “up” or “down” by other users, and the original asker can pick what s/he deems as the correct answer. Stack Overflow is where I know I go for a bunch of my own programming questions, and from my conversations with Adam and Trey I know they do as well. We hope this can be as useful as a resource for social scientists. Feel free to ask questions about Stata, surveys, R, LaTeX, data cleaning, etc etc. Someone’s gotta have an answer, right? I’m taking a preliminary exam in about a month so I’m very much embedded in the classics of comparative-historical sociology, as well as more recent revisionist works. As such I haven’t been able to dirty up with my usual nerdery. But I do tend to have a somewhat unorthodox approach to taking notes, partially inspired by my avoidance of anything formatted in Word, partially rooted in my love of emacs (sorry vi fans). I wanted a lightweight syntax (read, in plain text) for keeping notes that wouldn’t get outdated quickly and wasn’t just some terrible hack that I threw together but wouldn’t understand down the line. Enter Markdown. Markdown is a simple syntax that stores in plain-text and converts to valid HTML. It allows you to created ordered and unordered lists, define bold and italic words, headings and subheadings, and all other nifty features. What I really like about Markdown is that it makes it very easy to take outlines written in any text editor and turn them into attractive, easy-to-read webpages. It’s flexible enough to work on any computer and quick enough to use in lecture without having to fudge with formatting and idiosyncratic word processor errors.